Looking for the best Christmas books for kids? 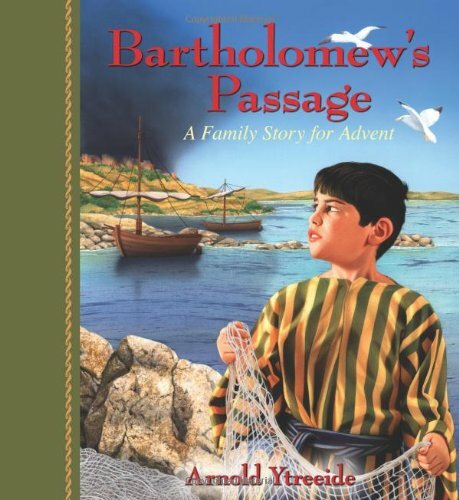 Check out this awesome selection of Christian Christmas books: Advent, board, activity, and picture books! When my kids were younger, I loved reading Christmas books to them! It was such a wonderful way to teach them about the Christmas story, complete with beautiful pictures and funny voices. It was such a precious time, and we made sure we incorporated that time throughout the month of December. Well, to be honest, we started reading Christmas books the day after Thanksgiving, when we decorated the house together. 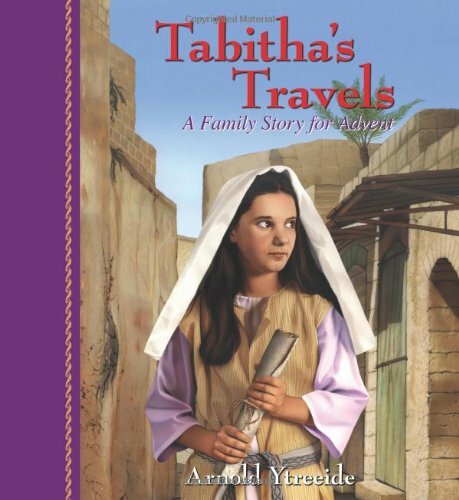 Most of the books we loved reading together are no longer in print, but there are some wonderful, biblically faithful books about the Christmas story available now that I know you’ll want to know about! I love that so many emphasize the gospel. The incarnation of Christ is a miraculous event that should ultimately point us to Christ’s majesty and his love for his people. There are many, many Christmas books available. However, your family library only has so much space, and these valuable resources get my vote! Advent is a special time of expectancy. As we think about what it was like for God’s people to wait for the arrival of the Messiah, Jesus Christ, we now wait patiently for his second coming, when all will be made right in the world. There are some really neat books out to help you prepare your kids for Christmas by teaching them about the coming of Jesus. 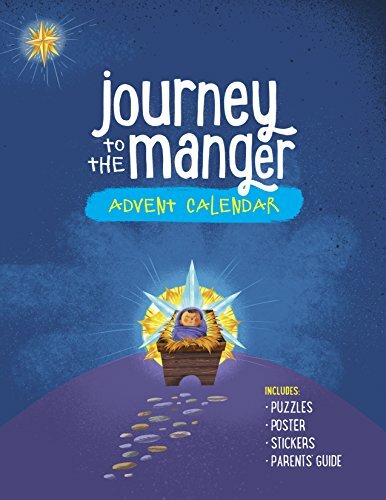 Journey to the Manger Advent Calendar from Focus on the Family ~ This daily family devotional includes puzzles, a poster with stickers, and a parent’s guide. 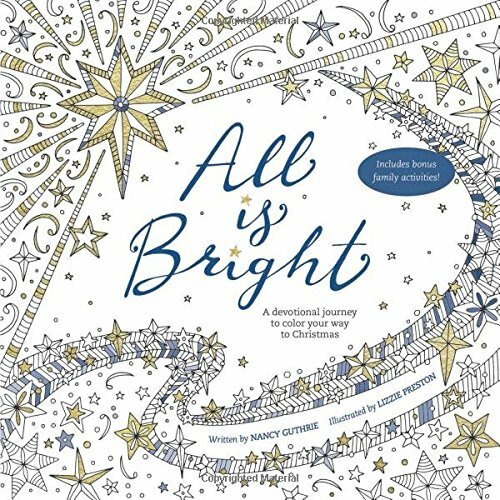 All is Bright: A Devotional Journey to Color Your Way to Christmas by Nancy Guthrie ~ This looks so neat to me! The coloring pages are perfect for a teen (or you! ), but it says there are kid-friendly coloring pages and activities available too. I read the first three pages in a sample file and really liked the devotions. 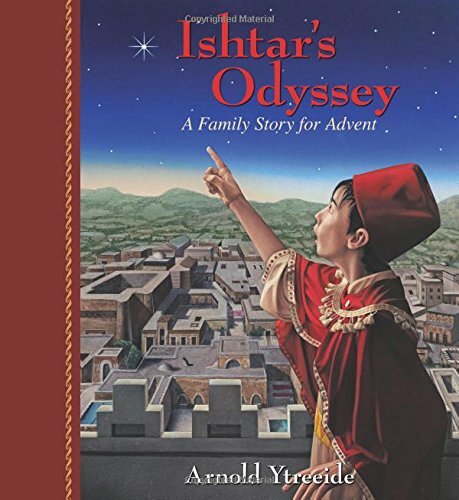 Advent Storybooks by Arnold Ytreeide ~ I haven’t read these storybooks myself, but I have friends who LOVE this series and they’ve purchased a new one each year to go through as a family. Each book in the series has daily readings and family devotional reflections. Board books are a wonderful way to teach your youngest kids about Jesus, and to let them have some hands-on time with their favorite Christmas books. These two books are a great place to start. 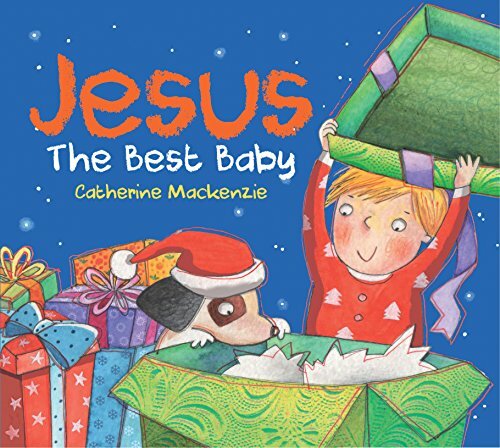 Jesus: The Best Baby by Catherine MacKenzie ~ Catherine MacKenzie’s board books are always awesome and Christ-centered. With just a couple lines per spread, and a related question, Mackenzie tells the Christmas story. I love that she ends with the gospel: “Jesus grew up. He died for sinners. But he came back to life. The best baby is the best Saviour. He loves you so you can love him. Do you trust Jesus? Is he the very best? Yes he is!” The illustrations by Lia Frassineti are adorable, too. 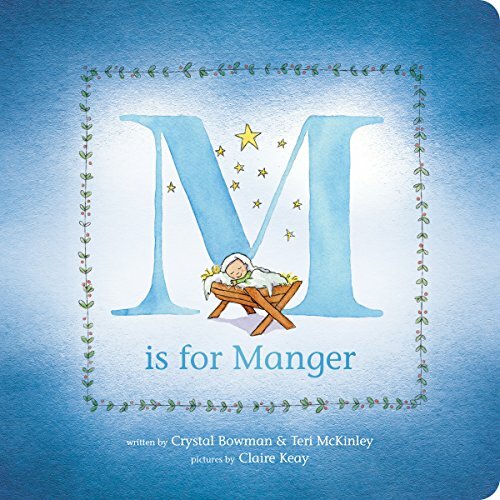 M is for Manger by Crystal Bowman and Teri McKinley ~ This super cute board book is also available as a picture book for your older children. These two activity books will give your children plenty to do as they think about the coming of Jesus. 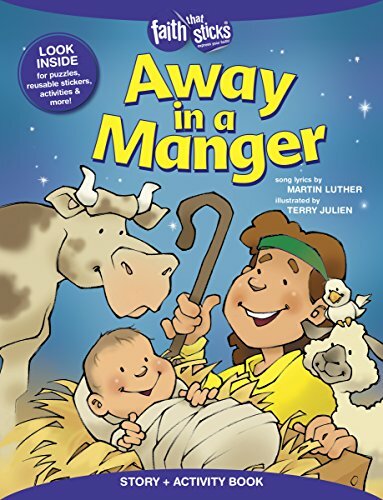 Away in a Manger Story and Activity Book by Martin Luther (the hymn) ~ Teach your kids the hymn Away in a Manger with stickers, activities, and discussion questions. 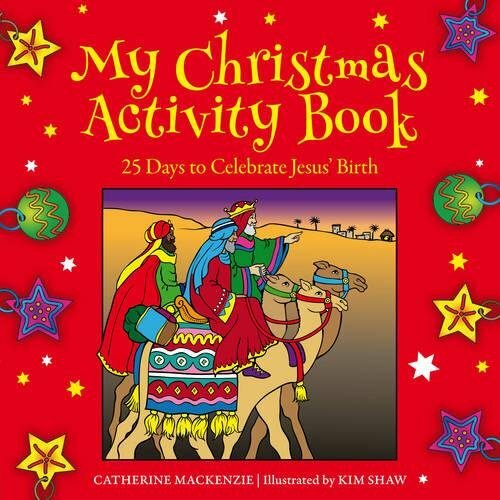 My Christmas Activity Book: 25 Days to Celebrate Jesus’ Birth by Catherine MacKenzie ~ This fun activity book would have been a favorite for me when I was a kid! There are so many picture books about the Christmas story. Here are four of my favorite. 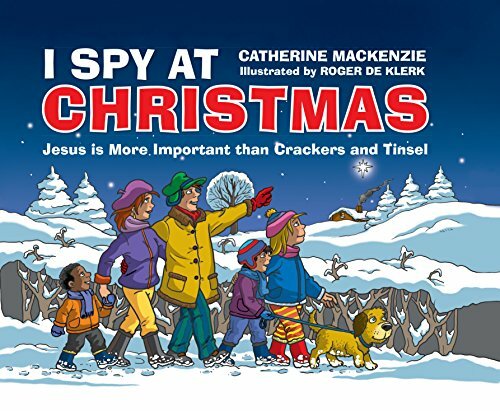 I Spy at Christmas: Jesus is More Important than Crackers and Tinsel by Catherine MacKenzie ~ This really neat book talks about a fun aspect of Christmas on every page, then relates it to a deeper spiritual meaning. For example: “I spy a fancy festive Christmas card. So I think of how God wrote me a letter – the Bible. Why did he do that? He wants to tell me about my sin and his love.” I love that the book tells the story of the gospel through common things we all see at Christmas. I think it would be neat to practice “spying” one thing a day and talk about attaching significance to that traditional Christmas sight. What a cool way to make the Christmas season more meaningful and memorable for your children. 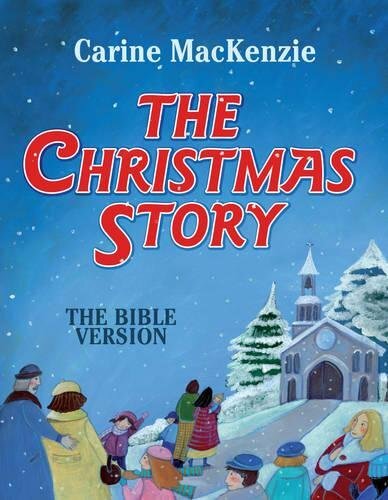 The Christmas Story: The Bible Version by Carine MacKenzie ~ This beautiful retelling of the Christmas story explains our need for salvation, and how Jesus came to save sinners. Read my full review here. 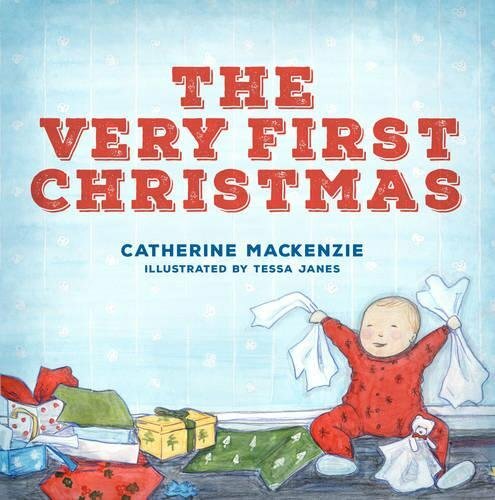 The Very First Christmas by Catherine MacKenzie ~ This sweet book for little ones contrasts the little reader’s first Christmas with the very first Christmas in history, explaining that the real gift of Christmas is Jesus. This is perfect for your kids up to age 5. Read my full review here. 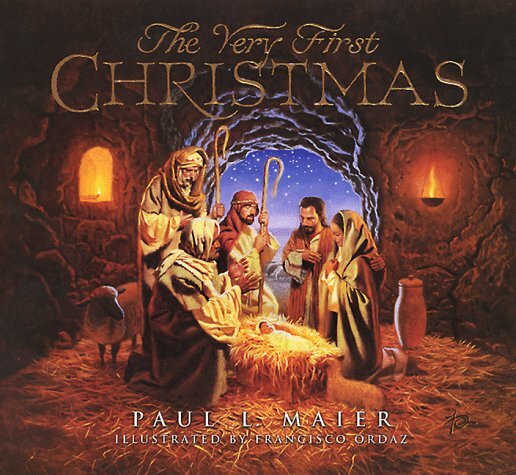 The Very First Christmas by Paul L. Maier ~ If you are looking for a wonderful, in-depth retelling of the first Christmas with historical context for your older elementary-aged children, I highly recommend this book. I read this beautiful book to my children every year they were old enough to understand. Whatever you choose, you’re bound to be pleased with these wonderful Christmas books for kids. I like that you have books for different ages represented here, some I’ve never heard of. Thank you for putting this list together! Thank you for the awesome list! I cant wair to order some of these asap!! I can’t wait to find a couple of these books to share with my youngest child over the coming weeks. Thank you this list and the opportunity to win! 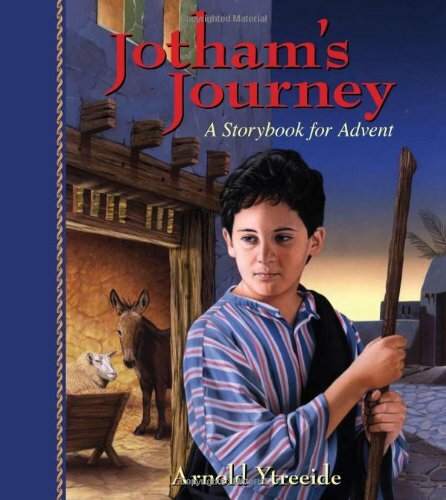 My kids love Jotham’s Journey so much that I used to have to read it every year, even when we read a different book. Now, two of them are old enough to read it on their own. They have dozens of colored tabs in the book to mark their favorite parts. Awesome! I need to get some of these books!! Thank you for a chance to win some. I want The Very First Christmas for my newest granddaughters first Christmas. Thank you for this helpful list of books! Many of the titles are new to me, so I am looking them up now. Books are such a wonderfully gentle and enjoyable way of sharing God’s truth. Many thanks! I am most excited about the I Spy at Christmas book. 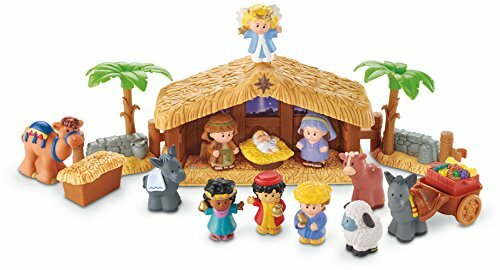 This is one of my favorite Nativity Sets! Love it! Love that you have SO many wonderful ideas to celebrate the Advent. These books look awesome! Can’t wait to check them out! I haven’t seen some of these resources before. They look great! I can’t wait to check them out for myself. Thanks for sharing! Away in a Manager is the one that I think my little one would like best. What a blessing to find new inspirational materials to share with my children. Thank you for sharing about these books and giving an opportunity to win them! I think my kids will like the I Spy book the most! We own all of the Arnold Ytreeide books and read a different one each year. Thank you! What a great collection of books. I’m definitely going to have to add hear to my list this year. Thank you for this detailed list! I’m most excited about Away in the Manger activity book and the I Spy at Christmas!! My girls love doing activities and I Spy! I need to hit the public library for some Christmas books. All of mine were destroyed during a move. I have kids ranging from 8 months to 14 years so this is an amazing resource for me! Love it!! I like I Spy At Christmas. I like the I Spy at Christmas book. That sounds like just the type of message we would like as we try to focus on the Lord and not the presents, decorations, and all that jazz. Thank you for the giveaway! Thanks you for sharing great resources for the season! Thank you for the chance to win! I think that I’ll try to find the I Spy book, because my nephew loves that kind of book. Love that you are making it easy to point our kids back to the real meaning of the season. A lot of theee are really great but I think my favorite is “All Is Bright”. Wow these are all amazing, hard to choose! The first Christmas by Paul M.
I am excited to check few of these books out for my ESOL (english as a second language) class. I am blessed to hang out with preschoolers and teach them english but I can use scripture too! thanks for making printable! Most excited about I Spy at Christmas!! I would love to actually have some more Christmas books. I was taking them out a week ago and realized we had a lot less than I thought and those look like a great start. Thank you for doing the giveaway. Thank you for all the great suggestions and ideas! I think the I Spy Christmas book looks like fun. My kids have always enjoyed “I Spy” books and I love how this relates things back to Jesus and the truths of the Christmas story.